Hi, Kent - Been meaning to send this "international invitation" earlier to you and all your FH readers that my radio show, "Uncle T. Jay's Vinyl Arkhives", will be celebrating our 6th anniversary on the air playing the Billboard hits from the First 25 Years of Rock & Roll. My 6th Anniversary show will be this Wednesday Night, from 9 PM - Midnight-ish (Mountain Time or 11 PM Eastern /8 Pacific) on www.kafmradio.org or just search for KAFM on the TuneIn Radio app.In addition to our normal features (tune in to find out what those are!!! ), we will be predominately playing the Billboard songs that peaked at the #40 position on the Hot 100 Pop Charts. Everyone plays the #1 songs, but nobody pays homage to the songs that barely cracked the national Top 40 Charts, usually only for a week or two ... the first songs that Casey Kasem would play on AT-40 shows in the 70s. I believe my first 45 RPM was by The Pineapple Heard in 1967. The A-side was 'Valerie" and the B-side was "Old Man River" on Diamond Records. This version came out in late '67, about six months before The Monkees' had a major hit with it in '68. They were from Upstate New York and considered as a very good regional group at the time. Actually The Monkees recorded this first and performed it a couple of times on their TV show. It SHOULD have been a HUGE hit single in '67 ... but this was right around the time Don Kirshner was fired and The Monkees took control of their own recordings. (I remember it coming in as the #1 Most Request Song night after night after night on WCFL, who was airing a copy taped off the television program ... as were many other radio stations across the United States.) The original track was written and produced by Tommy Boyce and Bobby Hart ... but The Monkees re-recorded a version in '68 as contractually they now had to have their own names on their releases. They tried to faithfully reproduce the sound as close to the original as possible ... and it was their last really big hit before the television series was cancelled. 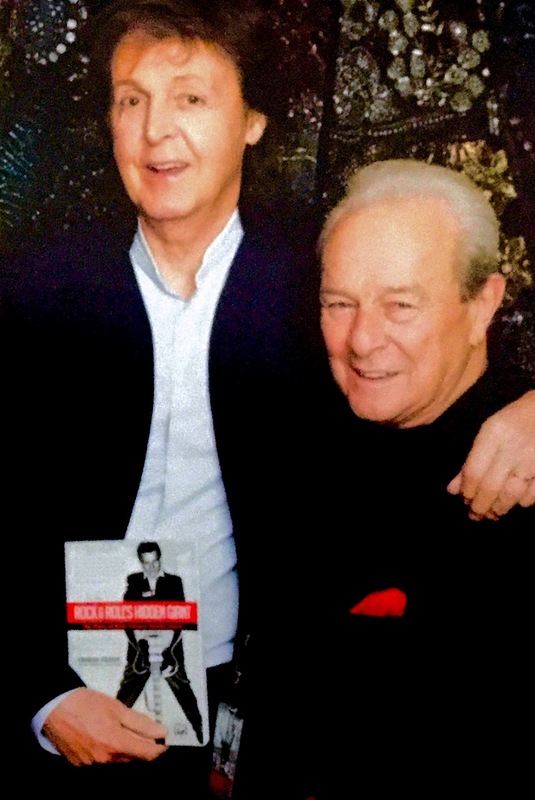 HEARTFELT THANKS to SIR PAUL for his contribution to the Foreword in CHARLIE's autobiography: ROCK & ROLL's HIDDEN GIANT (Alfred Music Press) (Amazon.com) ... or check your local Barnes & Nobles book retailers. 6/14/15: Charlie presented Paul with a signed copy of his book at the Wells Fargo Arena in Philadelphia. When we were starting out with the Beatles, the music coming over from America was magical to us -- and one of the artists who epitomized this magic was Charlie Gracie. The spirit of the times was captured beautifully by one of his big hits 'Fabulous' and I loved it so much I used perform it live with the boys. For me, those were times which were truly FABULOUS! Charlie and Paul ... with wife Joan and son Charlie, Jr.
GRAHAM NASH greets CHARLIE GRACIE with great affection after a magnificent Keswick Theater concert Saturday night outside Philadelphia. Graham expressed a desired to record with Charlie again, too -- so stay tuned! 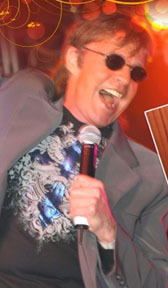 Graham's special commentary can be found in Charlie's autobiography: ROCK AND ROLL's HIDDEN GIANT. Charlie Gracie's concerts in the late 50's in Manchester helped me become the man I am today! Check out the Elvis auction. Do you want the jumpsuit or the gold pendant ? 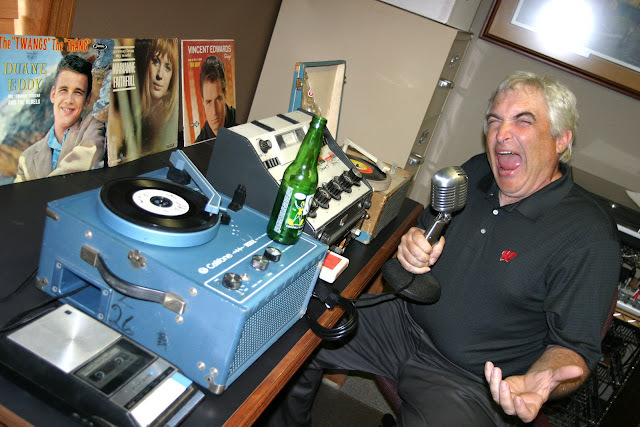 8/14/1956 = A Washington DC disk jockey forms the "National Society for the Prevention of Cruelty to Elvis"
1955 - Elvis Presley attended a meeting in Memphis with his manager Bob Neal, Colonel Tom Parker and Vernon Presley, at which a new contract was signed that named Colonel Parker as "special advisor" with control of virtually every aspect of Elvis' career. Parker was not really a Colonel at all, but a Dutch immigrant named Andreas Cornelius van Kujik. 1960, Elvis Presley started a five week run at No.1 on the US singles chart with 'It's Now Or Never', also No.1 in the UK. The song which was based on the Italian song, 'O Sole Mio', gave Presley his first post-army No.1. Songwriter Jimmy Webb is born in 1947. Vintage Vinyl News is reporting that a coroner's inquisition has determined that British singer and TV Host Cilla Black died from a traumatic head injury after a fall in her home in Spain on August 1st. When I saw the video you posted of Jimmy Durante introducing the Grass Roots, I thought immediately of the record Durante made in 1963, SEPTEMBER SONG, on Warner Brothers. Got a lot of airplay here in OKC and I can only imagine it received the same amount in Chicago. I wasn't listening to Top 40 Radio yet in 1963 ... but a quick check of Ron Smith's book shows that the Durante record never charted on WLS. I also scanned the Top Tunes Of Greater Chicagoland Charts and see that it charted for five weeks but only reached #34 on the survey. One of his follow-up records, "One Of Those Songs" was listed as an "extra" for two weeks as well in 1966. This is not what our studio really looks like. This was a promo shot for my show from a while back. Note the 45 on the near side is a station promo copy for the New Colony Six song I Want You To Know, released in August of 1969. The other turntable features Respectable by the Outsiders! I saw Dennis Tufano in Moreno, Michigan last night ... review and photos to follow. Needless to say, he rocked the sold out venue ! Yes, please do send us a review of the show ... and some photos, too! Meanwhile, Frannie sent me this picture of another recent Dennis Tufano gathering. Speaking of great concerts, Star Plaza in Merrillville, Indiana, has just announced a couple of superstar shows coming up in the next several months. First up ... Dennis Edwards and The Temptations Review on Friday, November 27th, part of the long Thanksgiving Weekend, with special guests The Spinners, The Dramatics, The Manhattans and Enchantment. It's all part of The Thanksgiving Soul Jam! And then, on January 30th, it's the annual Salute to the '60's show, starring Herman's Hermits featuring Peter Noone, The Buckinghams and The Grass Roots. 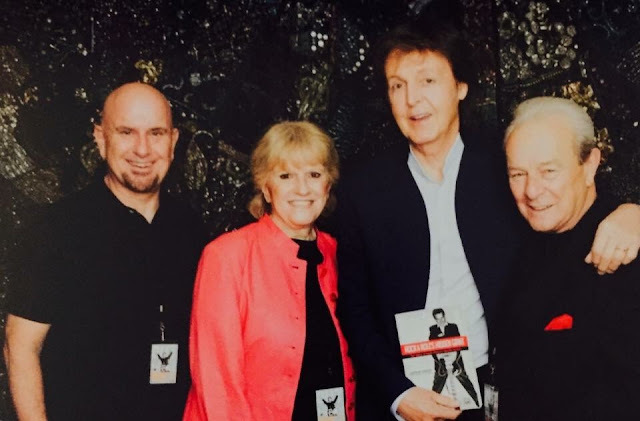 NYC - Much to the excitement of music fans worldwide, Kinks legend Dave Davies will be releasing a new live album titled “Rippin Up New York City: Live at the City Winery” on September 4, 2015, on Red River which is distributed by Sony / RED. The recordings were culled from two exciting live performances by Dave and his band in NYC in November 2014. In 1964, Dave Davies of the Kinks single-handedly made rock history when he sliced his little green Elpico amp speaker with a razor blade. Little did he know he was creating the 1st heavy metal guitar tone and riff in rock n roll, which he played on his band The Kinks' world wide hit “You Really Got Me”. Nearly fifty years after influencing generations of guitarists, Dave continues to rock and tour. His 2013 return to the U.S. to support the album “I Will Be Me” was a triumph both creatively and spiritually as he found new inspiration for his soon to be follow up album, the highly acclaimed, “Rippin Up Time”. Released in 2014, Dave embarked on yet another U.S. tour to support it. He was joined by Jonathan Lea on guitar, Tom Currier on bass and keyboards and legendary drummer Dennis Diken of the Smithereens. The tour swept through venues in Milwaukee, Chicago, New Jersey, NYC and many more. Jim Sclavunos played drums for one gig in Bethlehem, PA. On every date Dave Davies and band played a highly charged set of solo album favorites, Kinks classics and new tracks. 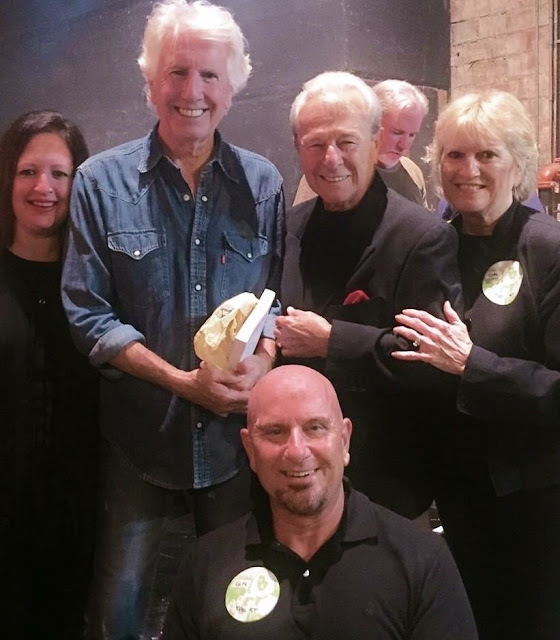 At the City Winery NYC on November 24 and 25, 2014, Dave and band put on an amazing concert to an audience of new and longtime Kinks fans, music industry stars and legends. They delivered two exhilarating nights of performances that rocked and ripped up the city’s nightlife. “Rippin Up New York City: Live at the City Winery” captures the live electricity of turbo charged rockers along with delicate and sensitive versions of acoustic favorites from past and present. A true genius who never fails to deliver, this Dave Davies live recording expresses the power, sensitivity, magnetism and creative expression of a seasoned yet spontaneous rock-n-roll visionary. Oct 2nd, 2015 - The Court of Honor Stage, The Big E, West Springfield, MA. 3 pm and 8 pm shows. Free with fair admission. Oct 3rd, 2015 - The Court of Honor Stage, The Big E, West Springfield, MA 3 pm and 8 pm shows. Free with fair admission. Oct 4th, 2015 - The Court of Honor Stage, The Big E, West Springfield, MA. 3 pm show only. Free with fair admission. Oct 20th, 2015 - The Howard Theatre, Washington D.C. Balloting has begun for this year's bi-annual Labor Day 500 -- the first since 2013 and fourteenth overall. Yes, we were Oldies when Oldies wasn't Old. Once again this year, we've expanded the ballot to your 15 favorite songs from the '50s, '60s and '70s. So please spread the word! Voting runs through Sunday, August 30 and those who request it will get a copy of the full list when it's out Labor Day weekend. And then again next Friday, August 21st, at The Paramount Theatre in Aurora. That gives Chicagoland '60's Music Fans TWO opportunities to see some of the biggest names in '60's Rock ... 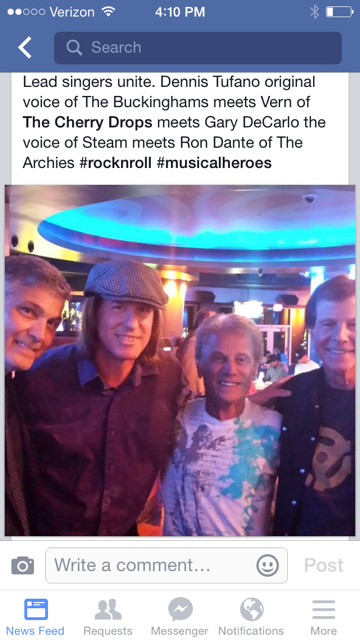 The Turtles, The Association, The Buckinghams, The Grass Roots, The Cowsills and Mark Lindsay, former lead singer of Paul Revere and the Raiders. Between them, these artists racked up over 70 Top 40 Hits ... and these shows will be hit-packed from start to finish. We hope you can make it out to at least one of these great shows. (bottom) The Cowsills, The Association and Flo & Eddie of the Turtles. The Happy Together Tour has played to a capacity crowd at Aurora's Paramount Theatre for YEARS now. (We've covered it the previous seven here in Forgotten Hits) You can order tickets to the Paramount Theatre performance through their website: ParamountAurora.com), call the box office at 630-896-6666, or stop by in person at the Paramount Theatre, 23 E. Galena Blvd. in Aurora, 10 a.m. to 6 p.m., Monday through Saturday. The Bolingbook show is a special added bonus in that this is a free concert celebrating the village's 50th anniversary. 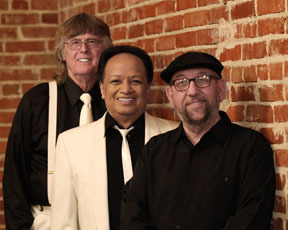 (Other acts this weekend include The Chicago Experience tonight and the midwest's premier Beatles tribute band, American English, on Saturday.) All shows will take place at The Bolingbrook Performing Arts Centre at 375 Briarcliff Road in Bolingbrook. Watch The Turtles sing "Happy Together"
It all started in 1965 with the breakup of one of the first folk rock ensembles called The Men. What was originally an 11-member singing group ultimately became the six-man band The Association. In 1967, The Association made history being the first band anywhere to open a rock festival - the now historic Monterey Pop Festival. Popular hits include "Windy," "Never My Love" and "Cherish." Jimmy Durante introducing The Grass Roots. Because why not? The Grass Roots had a series of major hits - most notably "Let's Live for Today," "Midnight Confessions," "Temptation Eyes" and "Two Divided by Love" - that help define the essence of the era's best AM radio. Although the group's members weren't even close to being recognizable, The Grass Roots managed to chart 14 Top 40 hits, including seven gold singles and one platinum single, and two had hits collections that effortlessly went gold. 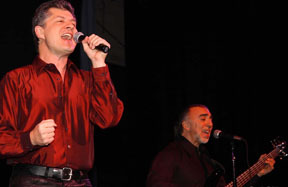 The Buckinghams pack power into 60s pop rock. Their #1 song "Kind of a Drag" is the standout favorite that first made them famous. Since then came seven national chart hits, 15 singles and eight acclaimed albums. The Buckinghams enjoyed phenomenal success with hit singles including the powerful "Don't You Care," the soulful "Mercy, Mercy, Mercy," and the national anthem of teenage love, "Hey Baby, They're Playing Our Song," on the national charts simultaneously. 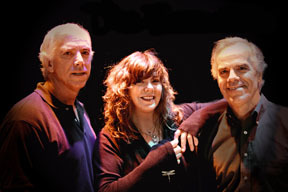 The Cowsills deconstruct their hit "Hair"
The real-life inspiration behind the hit television series The Partridge Family, The Cowsills were one of the biggest pop acts of the late '60s, distinguished by their angelic harmonies and sun-kissed melodies. 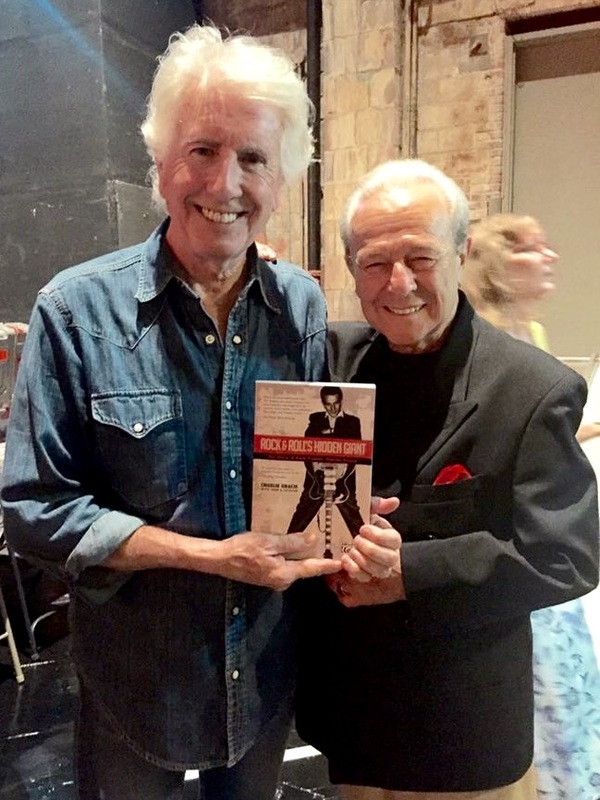 The group's origins lie with brothers Bill and Bob, who as children began their singing careers covering the Everly Brothers. Their hits include "Take A Letter to Maria" and "Hair." Upcoming shows at The Paramount Thatre include their Broadway musical series: Oklahoma (Sept. 16 - Oct. 18); A Christmas Story - The Musical (Nov. 25 - Jan. 3), Hairspray - The Broadway Musical (Jan. 20 - Feb. 21) and West Side Story (Mar. 16-Apr. 24). In addition to its Broadway series, Paramount's 2015-16 season also boasts Chicago frontman and solo vocalist Peter Cetera (Sept. 4), The Duke Ellington Orchestra (Sept. 5), Chicago's own Jersey Boys Under The Streetlamp (Oct. 25), Jay Leno (Oct. 30), Peter & Paul of the legendary folk trio Peter, Paul & Mary(Nov. 8), country music hunk Josh Turner (Nov. 12), Mannheim Steamroller Christmas by Chip Davis (Nov. 14), STOMP (Feb. 26 & 27), I Gotta Right to Sing the Blues (A Salute to Ella Fitzgerald, Judy Garland and Patsy Cline), (Feb 28) and Donny & Marie (May 25-29.) Visit ParamountAurora.com for more information.